On December 31, we have a “happy Noon year” party for visitors (kids) who won’t be up at midnight. 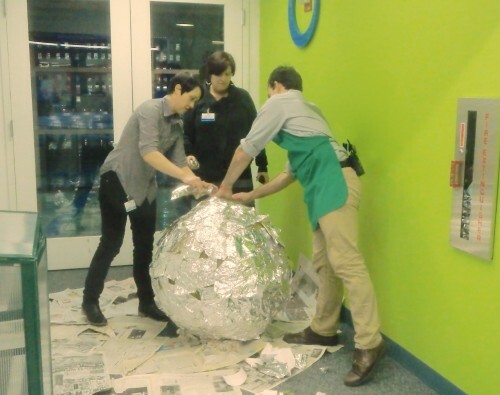 We drop a giant sparkly ball and sing Auld Lang Syne and it’s very cute. At 3:45 today, my colleague learned that the ball was broken. Suddenly, the whole area around his desk was flooded with people from the Education and Exhibits teams, and by 4:45, a new ball was complete. Go, team!